I started the week on a high note, finishing my Zuzu’s Petals cowl on Sunday. It was a fast knit, but not quite simple enough for lunchtime knitting. I could definitely see myself making another one. It seemed a little small at first, but then, through the magic of blocking, it became the perfect size, and quite magnificent! I love the lace, the points, the colors. I love how easy it is to wear, giving you the look of a shawl with the ease of a cowl. This was the perfect way to use this special skein, a souvenir yarn from our first college visit with the girl. Pattern is Zuzu’s Petals. Yarn is Ella Rae Lace Merino DK, in color 206. I used about 3/4 of the skein, and that was adding two rows at the end too. I’m not sure I’d make it any bigger. Something else fun: when I finished this project, I officially had zero WIPs! It was the craziest feeling. It was satisfaction in a job well-done, plus the exhilaration of knowing I could cast on for whatever I wanted with no guilt. I don’t know if I’ll ever experience it again, and it didn’t last long: I cast on a new sock Sunday night, so I’d have it ready for Monday lunchtime knitting. Have you ever finished all your WIPs at one time? Thank you! This is my first time WIP free since I started knitting four years ago. Probably won’t happen again any time soon! Such a pretty project! I’ve never had NOTHING on the needles… that would be a weird feeling indeed! It was!! That’s why I had to start something new ASAP! Very pretty! Zero wips? How does one do this? Um, keep knitting on the projects you’re tired of, I think? It’s pretty hard. Ahaha my WIPs are in double figures and probably will be for a while yet! I loooove this cowl. The shape, the colours, the texture – just perfect! Thank you! 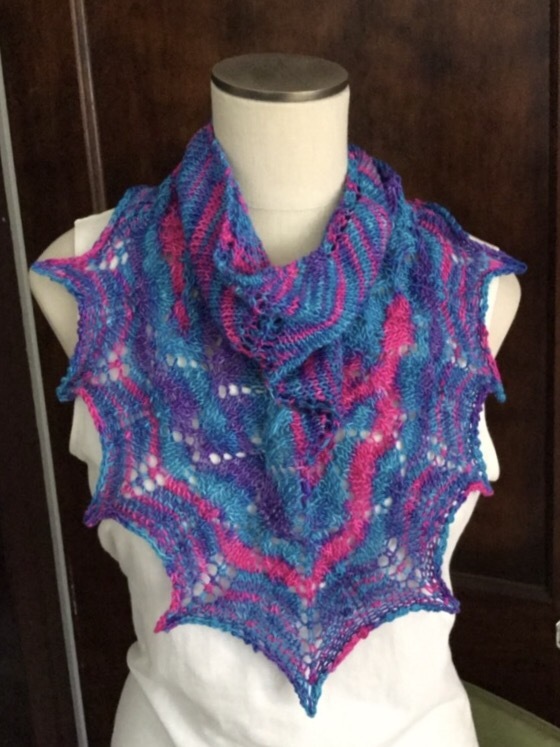 I do think it’s wonderfully designed, perfect for showing off pretty yarn. And I would not be surprised if my WIPs get that way with the holidays coming up!